Wendy’s is known for their fresh burgers, their chili, and many other great menu items. Here is my version of the Wendy’s Apple Pecan Salad. I love a great hearty salad. This fresh salad from Wendy’s is easy to duplicate at home. This is a wonderful salad to serve at home when you prepare this one yourself. You can even take a couple of extra steps to make this salad taste just a little bit better when you make it yourself in your own kitchen. What I really love about cooking from home is you can tailor your recipes for the way you eat. I like to use organic meats and vegetables when I can. The Wendy’s Apple Pecan Salad is the perfect salad to do this. I love to use organic chicken and organic apples in this recipe. You can buy organic meats and fruits at many stores, heck, even Walmart sells organic items now. You could use packaged salad for this recipe, or you can save some money by buying romaine and washing it yourself, and cutting it. Romain lettuce is very easy to work with, so it is easy to do. Some ways you can enhance the salad, you can toast the pecans in a skillet until they become fragrant. This will really help the flavor come through. I also like to use a nice quality of blue cheese to make this salad simply delicious. You can also chill the bowls you are going to serve in to add a little extra touch. When it comes to the perfect salad dressing you can buy some Marzetti® Simply Dressed® Pomegranate Vinaigrette. You could also make a quick homemade vinaigrette. I make these by adding 1 part vinegar, and 2 parts vegetable oil, and I add salt, pepper, and other dried herbs. No matter what you top this salad with you are going to enjoy this salad when it is made from your own kitchen. I know you are going to love this copycat recipe! 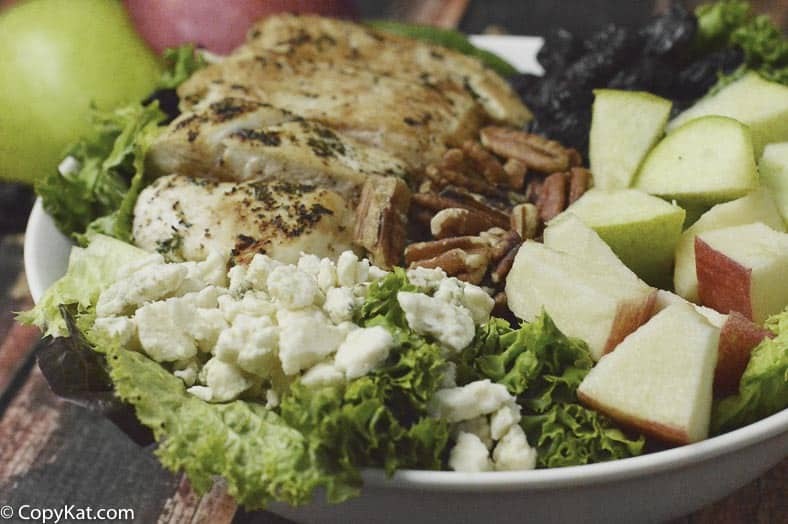 You can recreate Wendy's Pecan Salad at home with this recipe. Heat a skillet over medium heat, I like to use cast iron as it helps meat brown beautifully. Add your oil to the pan and let it get hot. Use a paper towel to blot away excess moisture from the chicken breast. In a small bowl combine salt, pepper, garlic powder, and parsley flakes. Sprinkle the spice mixture on both sides of your chicken. Place chicken into the skillet, and cook for 4 to 6 minutes on each side. You can use a meat thermometer to make sure the chicken has fully cooked. Allow meat to rest while you make the rest of your salad. Wash the lettuce and spinach, divide the salads between two bowls. 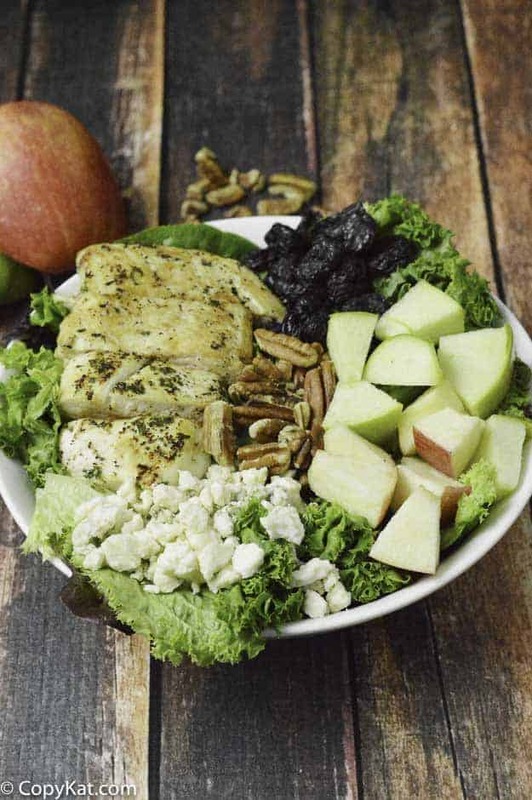 Build each salad by adding to each bowl: 2 tablespoons of dried cranberries, 1/2 of the red apple, 1/2 of the green apple, 1 tablespoon of chopped pecans, and 1/4 cup chopped blue cheese. Cut the chicken into bite-sized pieces and divide the meat evenly between the two bowls. Top the salad with the dressing of your choice. I’ve been making this salad at home since Wendys introduced it. Only thing, we can I find the Marzetti pomegranate dressing? I’ve looked all over and can’t seem to find. Thanks. Several of my supermarkets have it, but only Shaws carries the Pomogranate. It’s in the produce section, because it has a short shelf life…no preservatives. See the date on the bottle. Now…if I could just replicate the sweet-spicy pecans they give you! Only site I’ve seen which bothers to tell you how to season the chicken to approximate the delicious flavor of the chicken in the Wendy’s salad. Which is an indispensable part of the preparation, to get the right flavor. Kudos to you for providing this piece of necessary info. It’s important, bland chicken helps no one. Please copy Ruth Chris’ Stuffed Chicken. Very good. I think I love you! Thanks for posting this! I literally CRAVE that freakin’ salad! Well done! I am so glad you can make the soup at home now. I haven’t tried the Wendy’s salad, but this looks good. I’ll have to give this a try before summer is over. Your salad looks soooo good and easy to make! I am definitely going to try it! I love trying new salads!!! This salad looks right up my husbands alley! He loves blue cheese anything. This salad looks delicious and super easy to make! I am writing these ingredients down now to buy for my next grocery shop! Yum! I love trying all different kinds of salads! I don’t eat chicken but I bet this would still be delicious without it 🙂 Or maybe with some beans in their place? I don’t eat fast food very often, but when I do, I enjoy going to Wendy’s for a salad. I love the combination of sweet fruit and the saltiness of the blue cheese. Yummy! Honestly we don’t usually eat salads when we are at a burger joint but I can see me making this for my family. Looks delicious!